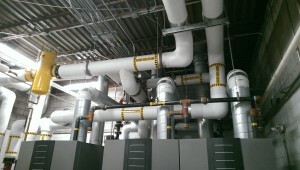 Commercial & Industrial Plumbing | National Heating & Ventilating Co., Inc.
National Heating and Ventilating has earned a reputation for the quality of our work and our integrity as a contractor. In 2011, we added commercial and industrial plumbing to our menu of services. Our seasoned and qualified employees bring a wealth of plumbing experience to every project, so you can expect the same quality of work as you do from every other job with our name on it. Visit our Projects page to see examples of our quality commercial and industrial plumbing work. We are never really finished with our projects. We foster lifelong relationships with our clients, and we welcome your questions or concerns. We are available to do what needs to be done to make sure you’re satisfied—now and in the future. At National Heating and Ventilating, our work does not take place in a vacuum. Design considerations affect our work, and our work, in turn, affects other trades. Our project management expertise allows us to work effectively as part of a team to ensure that your job is done right and that your project stays on schedule and in budget. To that end, National Heating and Ventilating offers value engineering services. Our experienced team will review plans, specs, 3D imaging or the actual space to assess the work that needs to be done or has been proposed. We will make recommendations to troubleshoot any potential issues as well to improve the appearance and experience the proposed plumbing work will provide. National Heating and Ventilating has the capacity and experience to meet all your commercial and industrial plumbing needs—from fabricating specialty pipes, installing boilers and chillers, to turning wrenches to fix a leaky faucet. Contact us to tell us about what you need, and let National Heating and Ventilating help you synchronize a cost-effective and energy-efficient solution with all your contracting partners. National Heating and Ventilating provides full-scope commercial & industrial plumbing services. Contact us to find out how we can add value to your contracting team.